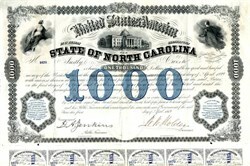 Beautifully engraved uncancelled $1000 Bond certificate from the State of North Carolina dated 1869. This historic document was printed by the American Banknote Company New York and has an ornate border around it with a vignettes of the state capitol, 2 medallions and angelic women. This item has the hand signatures of the State's Governor ( William Woods Holden ) and Public Treasurer, D. A. Jenkins. This item is over 147 years old. This bond was issued under the ordinance to amend the charter of the Western North Carolina Railroad Company as ratified on January 29, 1869. The State of North Carolina bond. This nice bond has a blue overprint and 59 bond coupons. Usual bond folds and a few pinholes. William Woods Holden was very active in state affairs and in the newspaper business. He started his newspaper career at the Hillsboro Recorder, then worked at the Raleigh Star. His rise in political circles was slow due to his switching from one party to another. 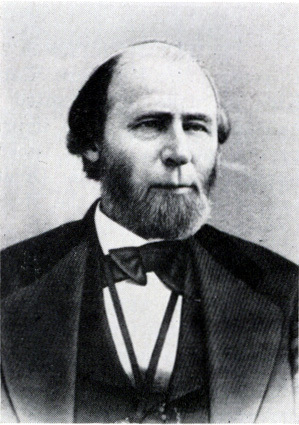 He changed from Whig connections when the Democrats offered him the editorship of the North Carolina Standard if he would become a Democrat. He made the Standard the most influential newspaper of the time in the state. During the early years of the Civil War, he switched from a secessionist position and supporter of Governor Vance to an opponent of the Confederate government and Vance. When Congress set up military districts to control the South and declared the civil governments to be provisional, President Johnson appointed Holden as Provisional Governor in 1865. When the next election was held, he was defeated and left office after just one year. He organized the Republican Party in the state and became associated with the carpetbaggers. With this base of support, he succeeded in being elected governor in 1868. His administration became full of corruption with one highlight being the Kirk-Holden War. In that instance, Governor Holden ordered Colonel George Kirk to make unwanted arrests and use the militia to control the Ku Klux Klan. The reaction by the public resulted in the Democrats winning a majority in the next election and the House of Representatives impeaching Governor Holden of high crimes and misdemeanors. Holden left North Carolina and went to Washington, D. C. to do newspaper work. When he returned to N.C., he became postmaster in Raleigh, living there until he died in 1892. He is buried in historic Oakwood Cemetery.